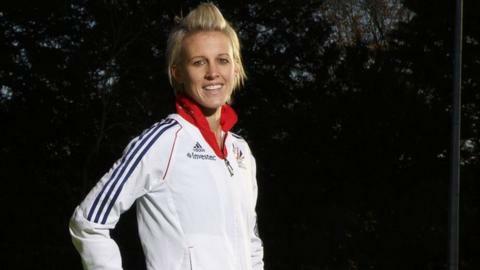 Great Britain's hockey captain Alex Danson said she "lost the ability to read" after suffering concussion. The Olympic gold medallist was injured after banging her head on a concrete seat on holiday in 2018. In an alarming post on social media, Danson said she had "lost [her] identity" throughout the process of recovery. "I was in bed for 24 hours a day for weeks on end," she said. The 33-year old forward detailed her harrowing journey, saying she hoped her story might help others "going through the same ordeal". Six months ago whilst on holiday, I hit the back of my head. I knew straight away something wasn't right, but as a typical athlete, I waved it away and tried to pretend I was OK.
Six weeks later I was rushed into hospital with a suspected bleed, being violently sick and having seizures. Six months on and it's been the hardest experience I have ever been though. When I came out of hospital a walk to the bathroom was near impossible and the very most I could do. I was in bed for 24 hours a day for weeks on end. I couldn't tolerate light, sound or people talking to me. My memory, concentration and ability to read or look at screens was zero. I'm getting there. I can now walk for nearly 30 minutes, I can hold a conversation and remember how to boil an egg! (Sadly it's not improved my cooking!) My headaches are still bad and I feel dizzy most days, but one thing I can guarantee is I WILL get there. One of the hardest parts in all of this, aside from the physical trauma, has been losing my identity. Going from leading my country, aspiring to qualify for the Tokyo Olympics to just trying to get through a day. Head injuries are serious, debilitating and lonely. To everyone that has been in touch, my family and to my amazing boy, you have been my lifeline. When I have days when I feel well enough, I will document some of my recovery, I will share what I have learnt as I also have so much to be thankful for. I've not been well enough up to now and I've not been sure whether it's something I wanted to do. Goodness, people go through far worse than this and have to be much stronger than I. But, I've always gained most joy in life by trying to serve others, and just maybe this will help one other person support someone going through the same ordeal. I think in doing this, it will help me. For all this has taken from me in the short term, I am determined I will take more from it in the long term.